The festival season is upon us and it's time for the first annual Taste of Toronto at Fort York. As someone from out of town, this was very easy to get to via TTC. Taking the bus from Union Station(which is a nightmare right now, can't wait until the construction is over! ), brings you right outside the fort; a short walk and you are there! There was a Crown Dealer right outside the gates. Crowns being the official currency of the event were conveniently located on a card. Tap & Go = Awesome. All leftover Crowns were donated to Second Harvest! Charity Donations = Awesome. Not every vendor accepted crowns, which was a bit disappointing. No one wants to put all their cash on their card and then find out you can't buy what you wanted. The menu card for the event was nicely laid out, so you could pick what you wanted, flip to the map and go! The signage could've been better. It was hard to find the food stall you were looking for. You had to walk almost inside the stall to see if it was the right one; always awkward when there's a lineup! All of the vendors that did not accept crowns had great signage. Go figure! We first headed for the Amex Lounge for some shade and seating. There were signs that said Tweet for a Treat. I tweeted, but remained treatless. It was a hot one and there was complimentary snacks and WATER, so really the shade and water was a treat at that point! Thanks Amex! There, we scoured the menu card for our first victims and made our way over. Our first stop was The McEwan Group. One's Fried Chicken had my name all over it. It came with a buttermilk biscuit, chipotle BBQ sauce and some homemade slaw. The chicken LOOKS big, but it really wasn’t. It was a wing, so there wasn't much meat on it, but the batter was fabulous. 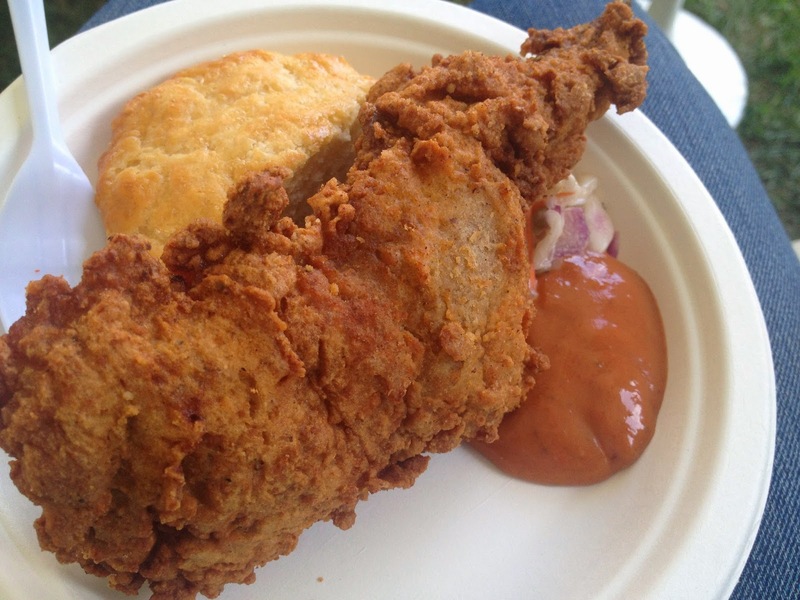 The chipotle sauce had some nice tangy heat, the slaw was fresh and the biscuit was not bad. Our second stop was Barque Smokehouse. They brought the smoker with them! Epic! As you waited for your food, the kitchen staff would retrieve freshly smoked meats from the smoker. Doesn't get any better! My friend went with the Barque Rack O'Bama and she said it was worth every crown. The ribs were large, meaty and seasoned well. They also had 3 house sauces to try, from sweet to heat. She tried all of them. 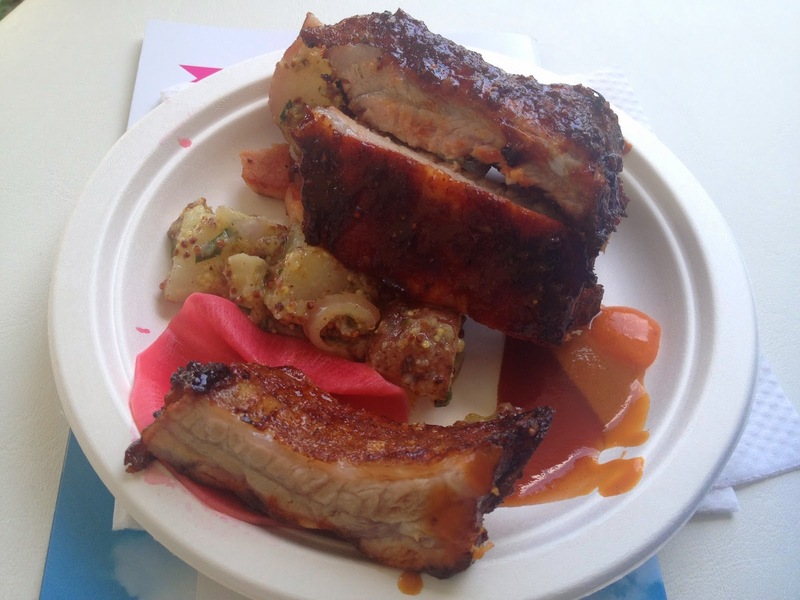 The candied, smoked bacon salad was the perfect pairing to these savoury ribs. The meal had a great balance of flavours for such a small plate! We can't leave without dessert! After consulting our handy menu card, we headed over to Richmond Station for a Station Ice Cream Sundae. No description on the menu, so we assumed we'd get some ice cream and chocolate sauce. We were so very wrong. This was THE most gourmet sundae I've ever had. 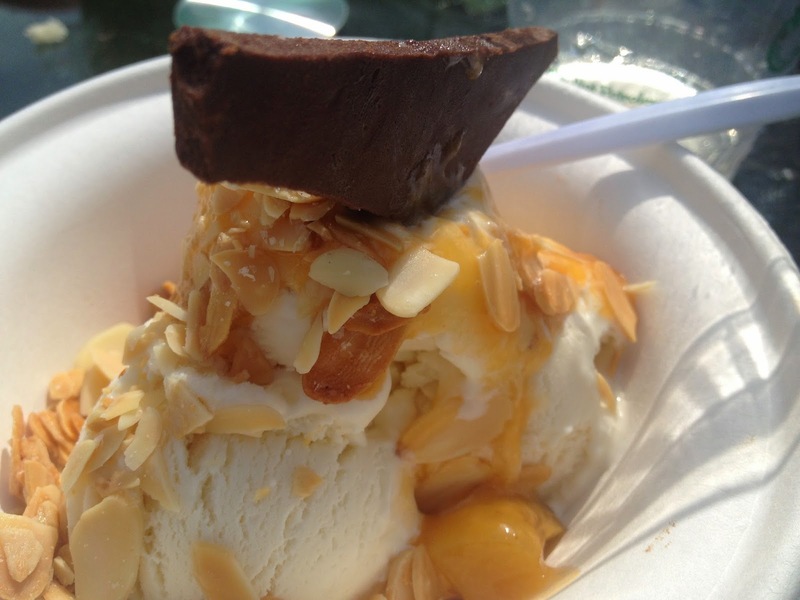 It had creamy vanilla ice cream and toasted, slivered almonds smothered in an apricot glaze and topped with a slice of chocolate fudge. Did I mention the glaze had chunks of apricot in it? The sweet of the apricot paired with the salt of the almonds made for a party in my mouth. We were thoroughly impressed. The bands were keeping it lively and the crowd was loving it. Lots of seating everywhere so you could eat, watch and listen. We were in the Small Producer's Market, directly beside the stage, and you could still talk to the vendors without yelling. In addition to the food, the vendors brought a variety of wares, ice cream, teas, meats, beers, wines, cheeses, etc, etc, etc. There was no shortage of samples either. 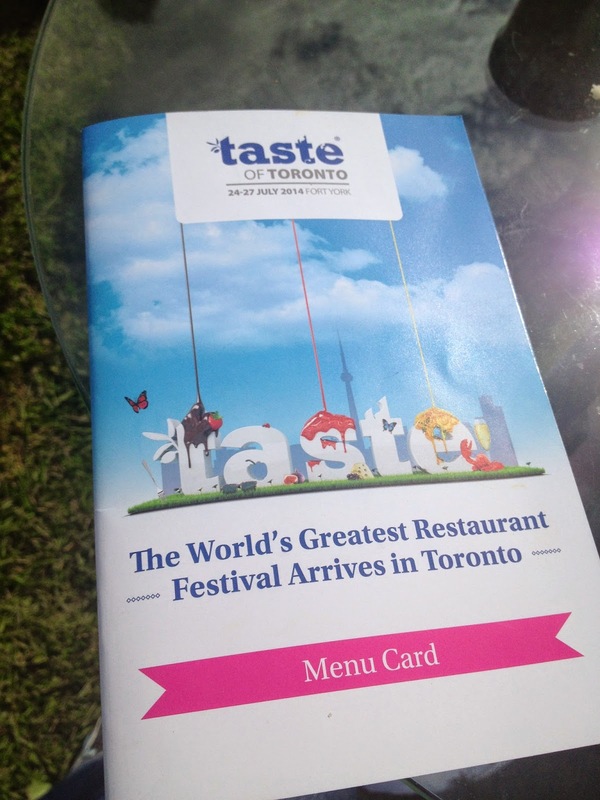 If sitting around eating delicious food isn't your thing, Taste of Toronto didn't forget about you. There was The Tasting Room with sessions each day to learn more about pairing food with beverages hosted by experts in their industry. Pairing not your thing? There's historical cooking classes as well! They had Ice Cream and Salad Herbs Workshops for you history buffs! Craving more cooking? There's Metro Master Classes with hands-on sessions to help you make the best eats. Not a cook? There's more to taste at the Electrolux Taste theatre hosted by Toronto's best chefs. That's a lot packed into 3 days! There was no shortage of things to do and no shortage of things to eat. What a busy weekend! You won't want to miss it next year!